Police are asking for help to find a 5-year-old girl who was kidnapped from her home in a northern suburb of Calgary sometime between July 10 and July 11. Taliyah Leigh Marsman was last seen at 11:30 a.m. on Sunday, July 10. The next day, her mother, Sara Baillie, didn’t show up for work. Relatives tried to reach her unsuccessfully and then, at about 8:30 p.m., police were called to her home in Panorama Hills, Calgary. Police found the mother dead in the apartment. The girl was gone. “The child is believed to have been abducted by an unknown person,” police stated in a Facebook post. Her mother’s death is treated as homicide, though the police haven’t released the cause of death yet. An Amber Alert was issued for the child at approximately 1:40 a.m., on Tuesday, July 12. Distraught relatives and friends of Taliyah and Baillie pleaded to Taliyah’s abductor (or abductors) at a July 12 press conference. 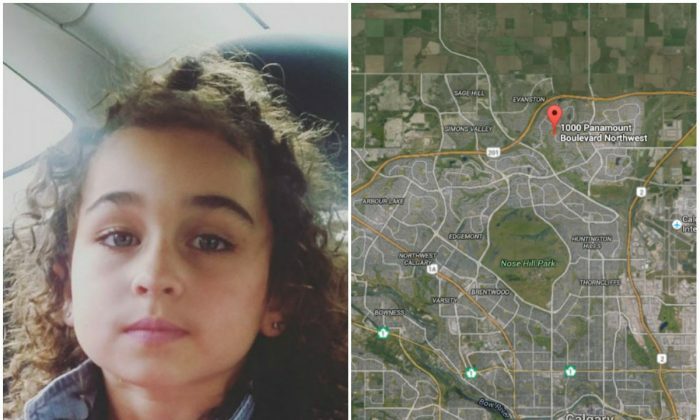 “Somebody out there knows where Taliyah is and that person or those people need to do the right thing,” said Inspector Dan Coleman of Calgary Police Service’s major crime section. Taliyah’s estranged father, Colin Marsman, is cooperating with the investigation. There’s a “limited history” of domestic violence, both reported and unreported, within the family, Coleman said. Taliyah is of mixed race, with a slim build, brown curly hair, and blue eyes. It is not known what she was wearing at the time of the kidnapping. She’s taller than most children her age and “very mature,” said one of the relatives and friends at the press conference. Anyone with information on Taliyah’s whereabouts is asked to call the Calgary Police Service non-emergency line at 403-266-1236 or the Amber Alert hotline at 403-53-AMBER (403-532-6237).